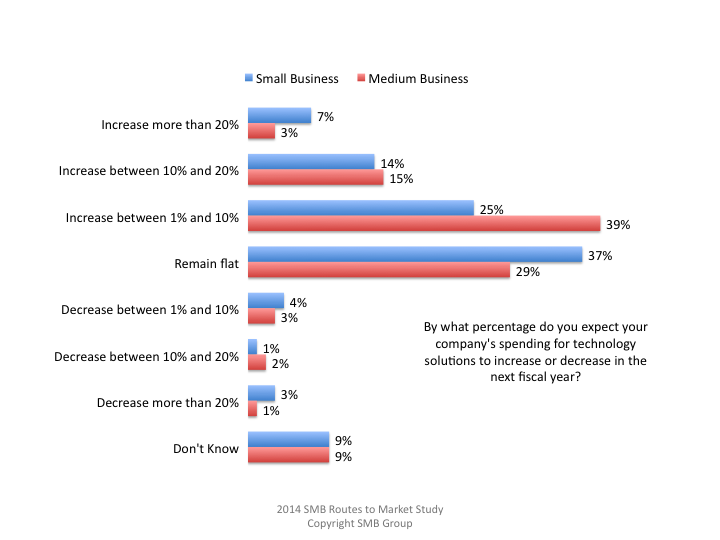 SMB Group recently wrapped up our 2014 Small and Medium Business Routes to Market Study, in which we looked how U.S. SMB (small businesses are defined as those with 1-99 employees, medium businesses as those with 100-999 employees) technology adoption and the buying cycle in ten key solution areas. As part of this study, we gather SMB perspectives their top business challenges, how technology impacts their businesses and technology spending plans. As SMBs grow, so do their top business challenges, as shown on Figure 1. Small businesses with are most concerned with growth and cash flow issues, such as attracting new customers (57%), growing revenue (47%) and improving cash flow (37%). These challenges remain important for medium businesses, with growing revenue (45%) and attracting new customers (40%) continuing to top the list. Business growth creates added complexity and some very significant differences in terms of business challenges. Most notably, medium businesses (33%) are twice as likely as small (16%) to view attracting and retaining quality employees and securing and protecting my company information as threats (22% and 9%, respectively) as one of their top three priorities. Medium businesses are also much more likely to put improving customer experience and improving employee productivity as a top challenge than small businesses. Regardless of what their top business challenges are, SMBs share a mostly positive view about technology’s role in helping their businesses. 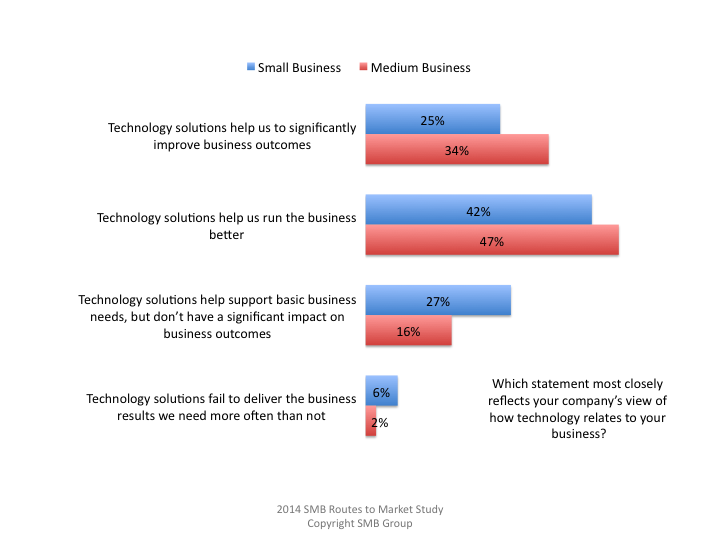 As Figure 2 reveals, 67% of small and 81% of medium businesses say that technology solutions help them to run their businesses better or that technology solutions help them to significantly improve business outcomes. While most SMBs’ believe that technology helps them achieve business goals, IT spending plans are a mixed bag. Although 46% of small businesses plan to increase IT spending over the next year, 45% anticipate flat or decreased spending on technology (Figure 3). Considering that 51% small businesses spend less than $10,000 annually on IT (excluding salaries). For medium businesses, the calculus is more bullish, with 57% expecting to spend more on technology, and just 35% expecting flat or decreased technology spending. However, most medium businesses plan for a relatively modest 1% to 10% IT spending increase. The good news for technology vendors is that most SMBs are making the technology-business performance connection. In addition, cloud-based solutions are making easier than ever for SMBs to benefit from technology. Our study shows that SMBs are steadily moving to the cloud, which eliminates the barrier of big upfront capital investments. All else being equal, the cloud has made it easier for SMBs to digest technology—both financially and technically—than comparable on-premises offering. However, given IT spending constraints, and the exponentially expanding array of tech solutions, vendors need to double down on demonstrating a direct relationship between helping SMBs gain business outcomes in the areas most critical to their businesses. Reading between the lines, it may be time to look at cloud pricing models the financial ability of SMBs to absorb additional monthly subscription costs. In anecdotal conversations with SMBs, I’m hearing more lately about what I call “subscription fatigue.” While price of an individual cloud solution may be quite reasonable, the costs for multiple solutions can add up quickly–and so can the complexity of managing different contracts. As monthly bills mount, solution vendors will need to go the extra mile to prove value–and continue to prove it month to month. In addition, especially in the small business space, some vendors, such as Google and Intuit, are moving to push the cloud price curve significantly downward. All of which points to the fact that its time for cloud vendors that target SMBs to take a more realistic look at the pricing and pricing models that they will need to build significant volume in these markets. Business solutions: ERP, financial and accounting; collaboration; marketing automation, contact and customer management, workforce management, business intelligence and analytics. Infrastructure solutions: security; data backup, online storage and sharing; server virtualization; desktop virtualization; integration. The study assesses the entire SMB technology solution purchase cycle, including needs identification, information sources, advice sources, key selection and short-list criteria, and purchase channels. Fielded in February 2014, the study is based on the results of a 700-respondent web-based survey of SMB technology solution decision makers and influencers, and segmented into eight employee-size segments and 18 vertical industries. Please contact Lisa Lincoln at (508) 734-5658 or lisa.lincoln70@smb-gr.com for more information about the study, including a Table of Contents. This is very true. We saw it in our conversations. Not clear what to do about it. Perhaps there is an opportunity for “bundlers” of some kind. May be an opportunity for the traditional VAR? VersAccounts offers a Modern Mobile Cloud ERP solution for Small and Medium Sized Businesses. One Price. Unlimited Users. All Modules.